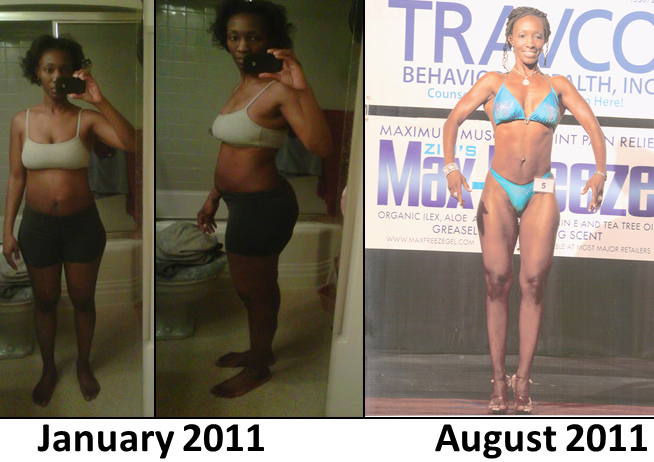 So, in January 2011, I had a revelation – I was quickly approaching 40, slowing down and getting fat! Something had to be done! So, I slowly started working out again, but that wasn’t enough. The weight was not dropping off at all! What was a girl to do! Well, I went to the Arnold Classics Fitness and Health Expo – YEP, THAT DID IT! I was going to become a Figure Competitor. I was so impressed and motivated by what I had seen! From March 2011 to August 2011, I dug in deeper and deeper. I consumed as much information as I could every single day and learned to eat right, or “clean,” and new ways to exercise to increase my metabolism and burn fat. In August, I competed in my first figure competition! You are so inspiring. I turn 50 in December so thought I’d take a cue from you and do a total fitness make-over. Unfortunately two weeks into a CrossFit regime, an old stress fracture to the femur reappeared and I had to quit. Any ideas for high intensity, low impact daily sessions? Thank you! First let me say, you look great! I would have never guessed it. I’m really sorry to hear about the fracture. I hope that you are seeing a physical therapist to strengthen that leg and learn how to prevent the fracture from recurring. Second, have your bone density checked by a physician. There are lots of high intensity, low impact exercises you can do. Try more light weight training with high reps, particularly with machines, because they help you mobilize the weight. Weight training helps strengthen bones and increases bone density, plus tones the muscles. Good luck! I’ll be checking in you, so keep me posted! Thank you. I am swimming, walking and cycling with weights a couple of times a week. I’ll add the machines in to ramp that up. I appreciate your counsel!